Excessive body fat is associated with negative effects on female fertility and pregnancy. In mice, maternal obesity impairs proper development of egg precursor cells called oocytes. In a recent paper published in Molecular & Cellular Proteomics, Qiang Wang and colleagues at the State Key Laboratory of Reproductive Medicine in China describe the link between poor oocyte development and oxidative stress in mice. The authors used proteomics to compare oocytes from mice fed a high-fat diet, which became obese, with normally fed mice. When they compared protein expression level in oocytes from these mice, they found numerous changes in mitochondrial and redox proteins, In particular, a mitochondrial protein called TP53-inducible glycolysis and apoptosis regulator, or TIGAR, was expressed at a lower level in oocytes from mice on a high-fat diet. To develop into egg cells that can be fertilized, oocytes need to complete a type of cell division known as meiosis. Researchers found evidence that TIGAR may play a role in the meiotic spindle, a cell structure that coordinates the movements of DNA in the oocyte. 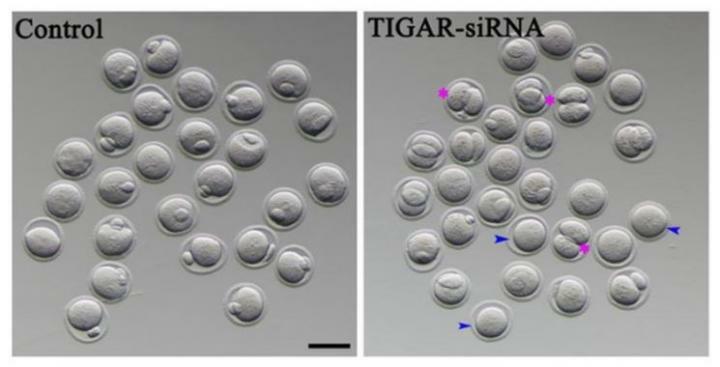 When the researchers reduced TIGAR level using siRNA, they found that oocytes were much more likely to divide unevenly, indicating problems with meiosis that could prevent production of a viable egg cell in obese mice. Eggs lacking TIGAR also had significantly higher levels of reactive oxygen species, a byproduct of cellular respiration. The researchers traced this result to TIGAR's known role in generating antioxidants. When TIGAR was depleted in mouse oocytes either by feeding or RNA interference, reactive oxygen species were higher, which activated a cellular quality-control pathway called autophagy. Wang and colleagues demonstrated that the ROS production that TIGAR suppresses is a driving force for downstream autophagy, providing a link between TIGAR-mediated redox homeostasis and cell development. This study provides evidence of the direct effects of maternal obesity on the quality of oocyte development and implicates TIGAR in oocyte maturation in mice. The finding may have implications for infertility treatments for obese women.